Hey Guys! Welcome you onboard. The table mentioned above shows the instant conversion from Celsius to Kelvin temperature. You can put any value in Celsius unit and get Kelvin value in return. 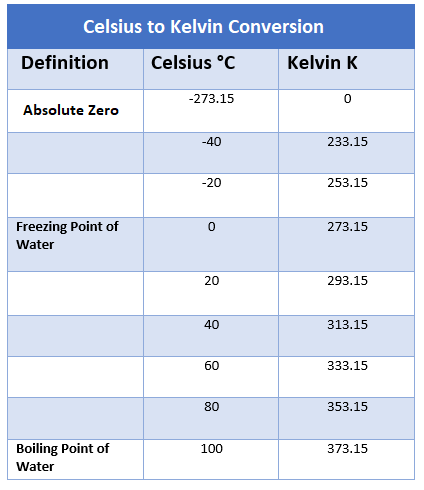 Both, Celsius and Kelvin are the units widely used for temperature. They don’t show a common sharing point and start with an offset value around 273.15. However, once the starting points of both the Kelvin scale and Celsius scales are reserved for the freezing point of water, they are equally separated and incremented with the same number. Following is the formula used for Celcius to Kelvin conversion. The K stands for Kelvin while C stands for Celsius. What is the value of 50 C in Kelvin? Following table shows some common values converted from Celsius to Kelvin. Note: Exact value of triple point of water is 0.01 C, 273.16K or 32.02 F.
The Celsius, denoted by C, is an SI unit of temperature that is defined in terms of Kelvin where -273.15 Celsius is equal to the 0 K – commonly known as the Absolute zero. This is a new definition of the Celsius scale that was coined in 1954. Before that, Celsius scale was based and referred to the boiling and freezing point of water where Zero Celsius termed as the freezing point while 100 Celcius was termed as the boiling point of water. The Celsius unit was named after Swedish Astronomer Anders Celsius. Before referring this scale as Celsius in 1948, it was widely recognized as centigrade which is a Latin word where centum means 100 and gradus means steps. Kelvin, denoted by K, is a thermodynamic temperature scale, based on Absolute Zero – the temperature at which all thermal motion stops to flow. The Kelvin scale is not written in terms of degree while other two scales Fahrenheit and Celsius are written with a degree sign. The Kelvin scale is named after physicist Baron Kelvin who proposed a need of “absolute thermodynamic scale. Until 1968 the Kelvin was widely written as the degree Kelvin ºK which had created the confusion as some people interpreted it as Rankins Scale. Also, the degree sign indicates the arbitrary value that is appropriate for Celsius and Fahrenheit and is not suitable for defining Kelvin as it predicts the absolute value. Defining temperatures in both Celsius and Kelvin is a common practice while creating content related to science and technology i.e. the temperature intervals are expressed in Kelvin scales and absolute temperatures are shown in the Celsius scale. The degree Celsius is nothing but a special name for Kelvin used for relative temperature. Similarly, Kelvin is, more or less, indicates the magnitude of degree Celsius. That’s all for today. I hope you have found this post informative as per your needs and requirements. Feel free to keep us updated with your feedback and suggestions so we keep producing valuable content and you keep coming back for what we have to offer. Thanks for visiting this page.